The glaciers in OGGM are represented by a depth integrated flowline model. The equations for the isothermal shallow ice are solved along the glacier centerline, computed to represent best the flow of ice along the glacier (see for example antarcticglaciers.org for a general introduction about the various type of glacier models). Let \(S\) be the area of a cross-section perpendicular to the flowline. 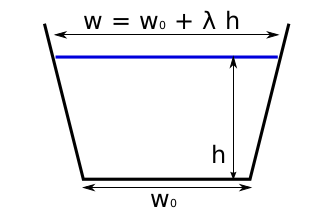 It has a width \(w\) and a thickness \(h\) and, in this example, a parabolic bed shape. where \(\alpha\) is the slope of the flowline and \(\rho\) the density of ice. Both the FluxBasedModel and the MUSCLSuperBeeModel solve for these equations, but with different numerical schemes. with all other things held constant, a change in section area \(\partial S / \partial t\) due to mass convergence/divergence will result in a different \(\partial h / \partial t\) and thus in different shear stress computation at the next time step. The simplest shape. The glacier width does not change with ice thickness. Trapezoidal shape with two degrees of freedom. 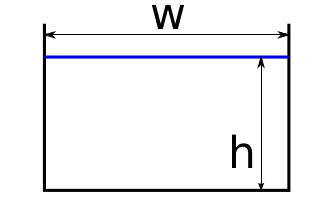 The width change with thickness depends on \(\lambda\). [Golledge_Levy_2011] uses \(\lambda = 1\) (a 45° wall angle). The parabola is defined by the bed-shape parameter \(P_s = 4 h / w^2\) 1. Very small values of this parameter imply very flat shapes, unrealistically sensitive to changes in \(h\). For this reason, the default in OGGM is to use the mixed flowline model. 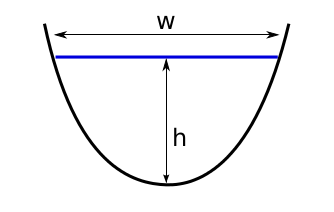 the local thickness \(y\) of the parabolic bed can be described by \(y = h − P_s x^2\). At \(x = w / 2\), \(y = 0\) and therefore \(P_s = 4 h / w^2\). if the parabolic shape parameter \(P_s\) is below a certain threshold, a trapezoidal shape is used. Indeed, flat parabolas tend to be very sensitive to small changes in \(h\), which is undesired. Most flowline models treat the volume conservation equation as a diffusion problem, taking advantage of the robust numerical solutions available for this type of equations. The problem with this approach is that it implies developing the \(\partial S / \partial t\) term to solve for ice thickness \(h\) directly, thus implying different diffusion equations for different bed geometries (e.g. [Oerlemans_1997] with a trapezoidal bed). The OGGM “flux based” model solves for the \(\nabla \cdot q\) term (hence the name). The strong advantage of this method is that the numerical equations are the same for any bed shape, considerably simplifying the implementation. Similar to the “diffusion approach”, the model looses mass-conservation in very steep slopes ([Jarosch_etal_2013]). The numerical scheme implemented in OGGM is tested against A. Jarosch’s MUSCLSuperBee Model (see below) and Hans Oerleman’s diffusion model for various idealized cases. For all cases but the steep slope one the model performs very well. In order to increase the stability and speed of the computations, we solve the numerical equations on a forward staggered grid and we use an adaptive time stepping scheme. A shallow ice model with improved numerics ensuring mass-conservation in very steep walls [Jarosch_etal_2013]. The model is currently in development to account for various bed shapes and tributaries and will likely become the default in OGGM. 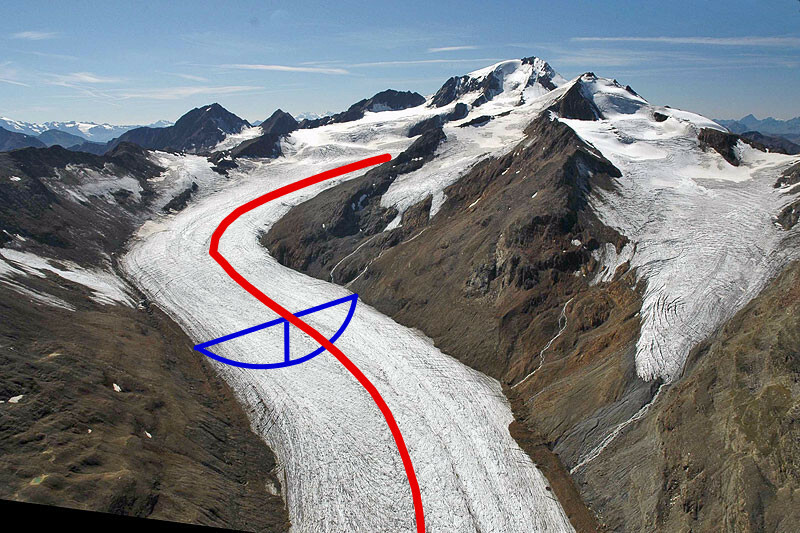 Glaciers in OGGM have a main centerline and, sometimes, one or more tributaries (which can themselves also have tributaries, see Glacier flowlines). The number of these tributaries depends on many factors, but most of the time the algorithm works well. The main flowline and its tributaries are all modelled individually. At the end of a time step, the tributaries will transport mass to the branch they are flowing to. Numerically, this mass transport is handled by adding an element at the end of the flowline with the same properties (with, thickness…) as the last grid point, with the difference that the slope \(\alpha\) is computed with respect to the altitude of the point they are flowing to. The ice flux is then computed as usual and transferred to the downlying branch. The computation of the ice flux is always done first from the lowest order branches (without tributaries) to the highest ones, ensuring a correct mass-redistribution. The use of the slope between the tributary and main branch ensures that the former is not dynamical coupled to the latter. If the angle is positive or if no ice is present at the end of the tributary, no mass exchange occurs. Cuffey, K., and W. S. B. Paterson (2010). The Physics of Glaciers, Butterworth‐Heinemann, Oxford, U.K.
Farinotti, D., Huss, M., Bauder, A., Funk, M., & Truffer, M. (2009). A method to estimate the ice volume and ice-thickness distribution of alpine glaciers. Journal of Glaciology, 55 (191), 422–430. Golledge, N. R., and Levy, R. H. (2011). Geometry and dynamics of an East Antarctic Ice Sheet outlet glacier, under past and present climates. Journal of Geophysical Research: Earth Surface, 116(3), 1–13. Oerlemans, J. (1997). A flowline model for Nigardsbreen, Norway: projection of future glacier length based on dynamic calibration with the historic record. Journal of Glaciology, 24, 382–389. © Copyright 2015-2019, OGGM Developers Revision 1e549f6f.